Spring is now really here! Come and see a documentary made by one of your neighbours, get relaxed during a yoga session or come and dance during our Eritrean themeparty. 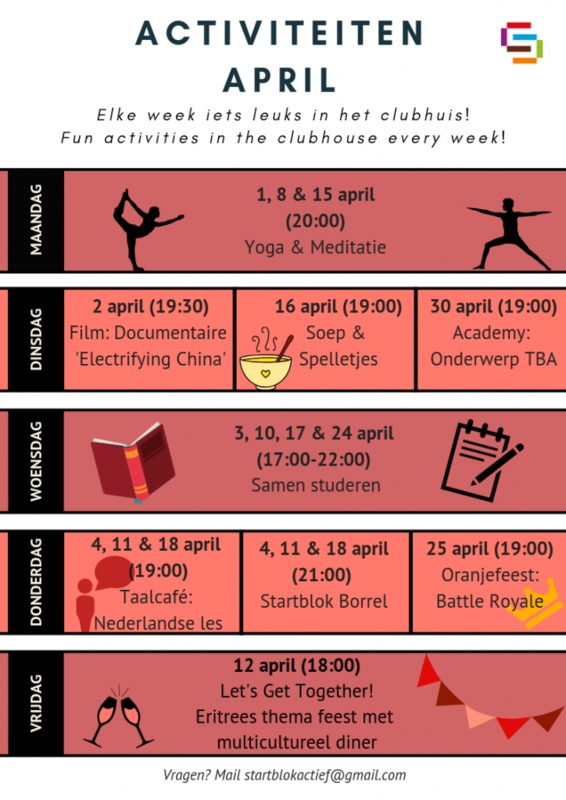 Our yoga lessons are back and will be given by Startblokkers Aylish and Hasan! Besides yoga they will also focus on meditation. Are you curious and in need of some peace? Drop by the Clubhouse! Would you like to learn (more) Dutch? Do you need some help with your homework? Or would you just like to chat with your neighbours? Join us at the Dutch ‘Taalcafé’ at Startblok. We will provide tea and coffee and some materials for learning Dutch. If you have specific questions, it works best if you bring along your books or homework. See you there! We invite everyone to the Startblok Clubhouse to study together every Wednesday! Do you need help with the Dutch language? Do you have questions about administration? Or do you just want to meet some neighbors and drink coffee? This is the place to be! Movienight in the Clubhouse! Koen, one of our own Startblokkers is organizing a movie night where he’ll be showing his (interactive) documentary about the emerging electronic music scene in China. Come join us at the Clubhouse to enjoy some warm soup and hilarious games like Cards Against Humanity and Charades! We have plenty of board games available, but of course you’re also free to bring your own if you like. Stop by the Clubhouse for drinks with your neighbors! Every Thursday night after the Taalcafé the Clubhouse will be open to catch up with your friends and start the weekend a little early. Just remember to bring your own drinks! Foundation Ykeallo and foundation Startblok Actief! join forces for this Eritrean theme party, with influeces from a diversity of cultures that are present at Startblok Riekerhaven. Get to know your neighbours even better, taste the food that the Startblokkers made together and dance the night away to music from every country. We’ll start with an international dinner at the Handbalvereniging Westsite, and at 10pm we’ll move over to the Startblok Clubhouse to dance until the early hours! Don’t forget to bring your own drinks!